Maccaferri India presents a case-study on the installation of a geotextile tube system at the 6th Asian Regional Conference on Geosynthetics in New Delhi, India. Maccaferri India will present several projects at the 6th Asian Regional Conference on Geosynthetics. The 6th Asian Regional Conference on Geosynthetics will be held in the Manekshaw Centre, in the Cantonment of New Delhi from the 8th-11th of November, 2016. The event centers around Geosynthetics and their use in the engineering and construction worked. The event is expected to be a conference of technical excellence and a showcase of Indian Traditional hospitality. Maccaferri is a platinum sponsor of the event, and will be presenting a series of case studies, each of which focuses on geosynthetic applications and solutions. The following summary of a case study on the application of geosynthetic tubes designed for the siltation of a trestle location is one of the projects that will be presented at the event. Ships halting at the receiving trestle of the Petronet LNG Ltd.
Terminal at Puthuvypeen, Kochi were facing a problem due to the accumulation of enormous amounts of silt in the trestle zone. Given this, the main objective of the project was to provide a long-term solution for achieving the required utilsation at the LNG Jetty, by reducing siltation and to protect the beach from erosion. 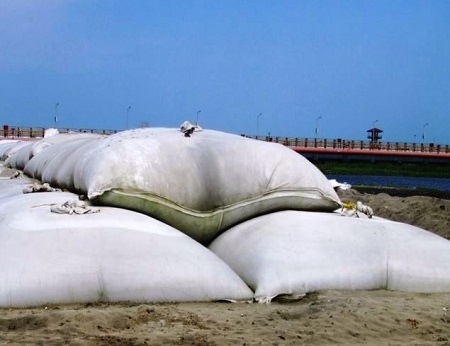 A 500 m long protection bund was planned to be built using Geotextile tubes and Geotextile Bags at the back of the LNG basin to prevent the erosion of the beach. The Protection Bund restricted the progressive movement of the high tide line toward the LNG basin. A Groyne of 150 m was constructed using Geotextile Tubes to trap the silt that is transported and accumulates in the trestle zone. The Groyne structure installed in parallel with the trestle restricted the movement of the silt. The scope of work included the construction of a Beach Protection Bund, a Groyne and the extension of an existing rubble mound. For the break water structure which extended 500m into the sea, Maccaferri Geotextile tubes were to be installed 1m underwater near the shore and 3.5m underwater offshore. The project was completed successfully. The solution is monolithic, versatile and flexible in nature. Currently, reduced levels of siltation can be observed, and vegetation has established on the geotextile tubes. For more technical information, please download our CH.